Fine MicroEtch® Screens from Stainless Steel are manufactured by Tech-Etch using photo etching technology. Photo etching enables designers to specify a straight hole or a tapered hole, which facilitates liquid filtration and back flow cleaning. Hole sizes range from .003" and up. Unlike stamping, photo etching yields a burr-free product resulting in cleaner more efficient screens with greater material integrity. MicroEtch® screens feature a tighter tolerance on hole sizes and greater dimensional stability than woven wire mesh, making them ideal in applications requiring frequent cleaning or in devices where there is mechanical contact. Unlike woven wire mesh screens, the fixed photo etched openings will not change through use. 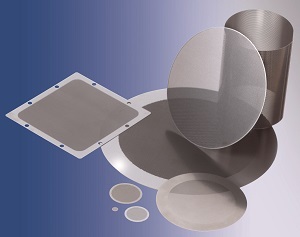 Typical applications of MicroEtch® Screens are particle separation and sizing, hydraulic valve screens, fuel filters, laser light filters, extruding screens, as well as filters used in the medical market. These tight tolerance screens are primarily produced from Stainless Steel, but other materials are available. Tech-Etch, Inc. offers a standard line of screens with holes in a 60° or 90° pattern that are available with a maximum guaranteed perforated area of 18" x 21". Other sizes and custom shapes are also available.